1. Dip the chicken breasts into the egg, then roll them in the cornstarch. 2. In a small amount of oil, fry the chicken until just browned. 3. Place the chicken in a shallow baking pan, pour the sauce over it, then bake it uncovered at 325° F (160° C) for one hour, turning the chicken every 15 minutes. *sometimes i double the sauce recipe and keep some aside to put on rice after it is done. *also, you can add green peppers, red peppers, pineapples, or onions. I was just wandering around blogs and came across yours. I think I find you on Your Heart Out, but since I’ve been roaming for an hour, I’m not sure. :”) I just wanted to let you know that I’ve enjoyed several of your entries. don’t worry, it really is an easy one and it’s super yummy! Yum. I make sweet and sour chicken, but I always buy my sauce. 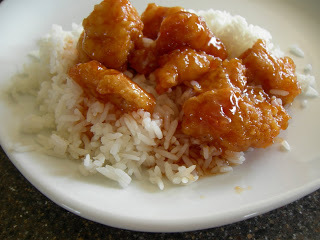 I have been looking for a good sweet and sour sauce recipe. Thanks! !